This Charlestown mom snagged a world record for running 242 miles in two days. Falbo runs the Umstead 100-miler in Raleigh, NC, in April 2014. /Photo courtesy of Traci Falbo. When Traci Falbo, 42, is not driving her two kids to high school, working as a physical therapist or hanging out with her husband, she’s running — up to 90 miles a week. This Charlestown resident recently won a world record for running 242 miles in 48 hours. Traci is an ultrarunner, meaning she runs distances longer than a marathon (26.2 miles). 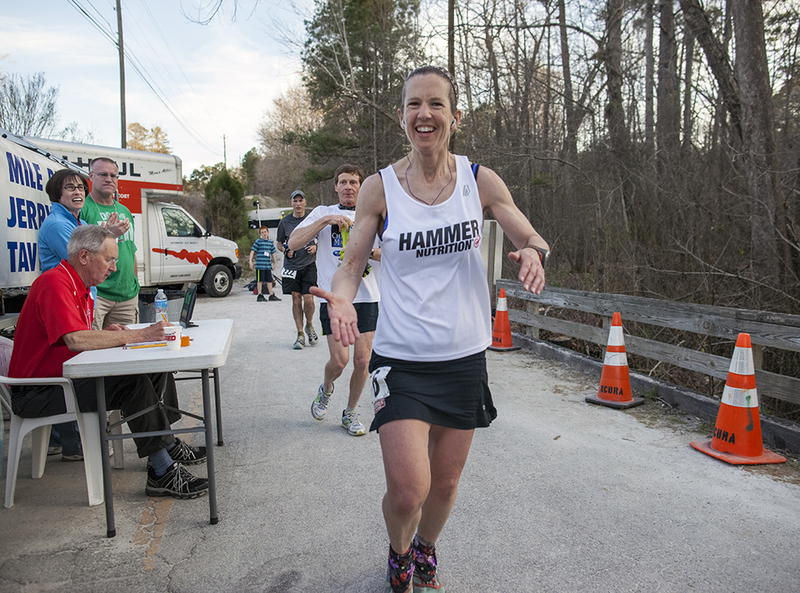 She has run 94 marathons and over 20 ultras, but this was her first 48-hour race. She shared what running has taught her with 812. I have to pace myself. It’s easy to go out too hard when you’re racing on your own. It’s best to go in even paces. I’ve never been very good at short distances. The longer I go, the more competitive I seem to get. I’ve been blessed with muscles that can go forever. You can’t let negative thoughts stop you. Fill your head with something else — I’ve counted to 100 and started over, I’ve thought of mantras, I’ve listened to music. I listen to stuff that gets you going for some reason or another. In ultra, especially, you have a ton of time to think you can’t. It’s a matter of being stubborn. You have to get creative with your time. Sometimes I would run up to 90 miles a week, and that’s a ton of time. So you have to be creative about it. I’d take my kids to practice and run when they were at practice, drive home, run some more. Dreams are possible. I accomplished my top dream after I set the record, but had I not accomplished it, I would still be glad I went for it. It’s sad if people want things in life and never go for it. We learn the most from our failures. So go for it. Otherwise, what’s the point? My worst moment during my 48-hour race was after I lay down for the last time. I was glad I’d slept, but I freaked out because I’d lost all that time. I knew I’d have to run a good pace, and if I had problems, there was no way I would get the time I needed. That’s where my husband and friends came in and said great things to pick me up. For a while, you really wonder if you can finish. But after I got up, I ran 12-minute miles for the last 14 hours. I’ve seen overweight people do it, people who are two-packs-a-day smokers do it. I’ve seen disabled people do it, blind men do it. If you really want to do something there’s no excuse to say you can’t.